My kids’ favorite breakfasts are pop tarts and pancakes. Not exactly the best nutrition to start the day. I’ve been making my own homemade panckes for about a year, and though that is cheaper and more nutritious than any processed frozen breakfast, I wanted to see if I could make it a little healthier. Last week I bought some green apples on sale for $0.99/lb, so I decided to see if I could shred some into my pancakes undetected. I also thought some cinnamon might be a good addition, and some vanilla wouldn’t hurt either. I took my Homemade Pancake Recipe and doubled it. (Click here to see it.) I peeled a green apple and grated it into the dry ingredients, mixing a bit. Then I added about a teaspoon of ground cinnamon. Once the wet and dry ingredients were mixed, I added about a 1/2 tsp. of vanilla. For this recipe I used white whole wheat flour, and I couldn’t tell a difference at all like I can sometimes with baked goods. So this is another good recipe I can make healthier by using white whole wheat flour. This is a perfect recipe for busy moms, especially working moms. I always make a double batch now and freeze the pancakes between parchment paper (wax paper doesn’t work, trust me). Then on busy mornings, I just pop the frozen pancakes in the toaster. 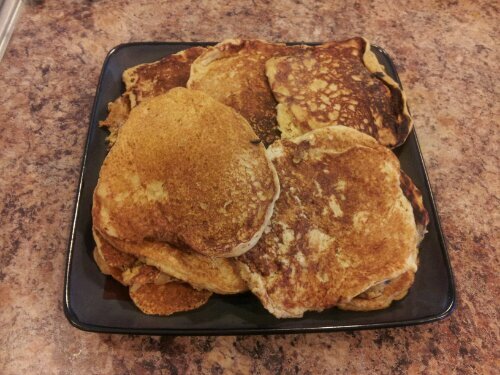 When I was working, I’d make the batch on a weekend and have plenty of pancakes for the rest of the week or even more.